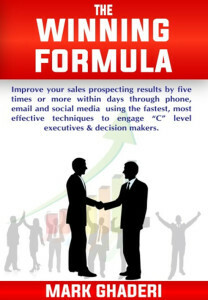 The Winning Formula will show you the most effective sales prospecting techniques to reach the ‘C’ level executives and decision makers, increasing your lead generation success rate by five times or more! 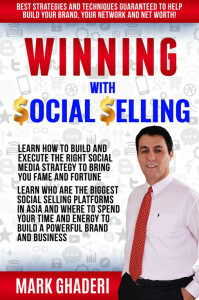 The Winning Formula is a game changer, I was blown away with the knowledge I gained from this book. I am now more than equip to catch the interest of C level executives and keep their interest which is the most important part. I highly recommend! I learned techniques in this book that I would have never thought of on my own! Prospecting is very hard but thanks to the Winning Formula I've got skills to snag their attention from the first call, email or hand shake. "...Mark shared this book with me as a reminder that even the sharpest tools need reshaping to adapt to changes. The insights on The Winning Formula depicts the daily conversations we have that enables even the novice of sales communicate in the most basic way: asking. The practice of repetition forms habit, and this book captures thru its chapters - a guidebook so to speak. As a colleague and friend, I thank Mark for sharing me this book that captures the common sense of good corporate communication."